A small elegant greeting card for the wedding day of your loved ones or friends.Wishing them joy, love and happiness with this small bouquets of pink roses. Miniature card with a bouquet of pink roses for birthday or other celebration. 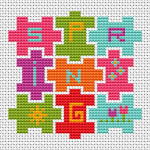 Let's meet the spring with joy and cheerful mood for more cross stitch projects. 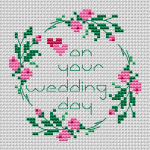 A very sunny cross stitch design for a small greeting card.So much light, sunshine and yellow color, that everyone feels happy. 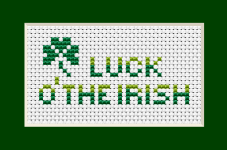 We love St. Patrick's Day.To stay in the Irish spirit use this simple cross stitch design to create your own greetings cards,bookmarks or tags.Good Luck! 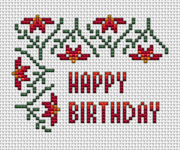 Send greeting with this little charming birthday card to someone.Let them know how much you care on their day of celebration:Happy Birthday ! In Bulgaria, Saint Nicholas' day is celebrated on the 6 December. 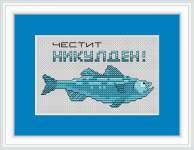 He is the patron saint of fishermen.The text in Bulgarian says: Happy St. Nicholas' day! 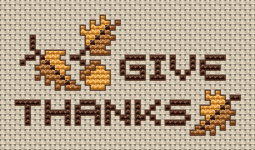 Little Mister Jingle Bell cross stitch pattern for red Aida.Use 2 strands of thread for the text Merry Christmas and 1 strand for the backstitch.